Review: Wanda / It's Just Movies Review: "Wanda"
Take yourself back to that wondrous time in American cinema before special effects, mind-bashing soundtracks and explosive car chases. 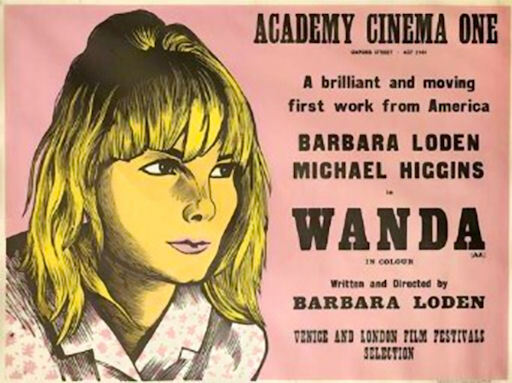 Barbara Loden put this masterpiece together in 1970 for a budget of essentially zero compared to present-day numbers. In a production stripped to the bone, there is no soundtrack other than dialogue and the sounds of traffic on the harsh streets and highways that make up Wanda Goronski’s life. The movie is being released in a fully-restored version of the original 16 mm stock by the UCLA Film and Television Archive. Kicking off in the starkest, most desolate coal mine yard in recession sucker-punched Pennsylvania, Wanda wakes up on a couch in her sister’s living room in a stupendous hangover. The squalling of the baby in the filthy cracker box company shack resonates for the rest of the movie. Her sister’s husband looks at Wanda like she has leprosy, cholera and AIDS, all at the same time. Wanda walks to her former sweatshop job, begs for second chance and is rejected. For the outcast, things go downhill from there. Wanda is an outcast not because people do not like her, but because she has intentionally rejected normalcy and those around her know it. She has taken Timothy Leary’s tune-in, turn-on, drop out message literally. Only she did not have to tune in; the alienation memo hit her on the head like a sledge hammer. In the same year, 1970, Jack Nicholson sent the message to a much larger audience in “Five Easy Pieces.” The same stark highway, an oil field instead of a coal yard, a road movie where the viewer is on the cement right along with the characters. Barbara Loden and Karen Black boil up out of incipient feminism like pigeons from hell. In “Wanda,” Michael Higgins plays a pitch-perfect male uber-loser Norman Dennis. Dennis is a criminal and Loden’s screenplay nails that surely enough. The punch line is that he is more adrift than malevolent. Like Nicholson’s character Dupea he suffers from devastating self-image issues because of his rejection of his father. This resonates with the outcast mentality of the counterculture zeitgeist; a rejection of outdated norms but a dearth of suitable alternatives. Wanda and Norman both suffer this same hopelessness. The key is that they find redemption, of a sort, in each other. Although Dennis is lacking in nearly every shred of decency imaginable, he does warm up to Wanda as the movie progresses to its climax. This builds the tension in a marvelously nerve rattling manner that begs for a happy ending, on the one hand, and yet somehow assures us that we already know the ending. Peter Fonda in “Easy Rider” had already showed us what happens to people who think too far out of the box. “Wanda” may be a cautionary tale about being careful what one wishes for or an argument for having the fundamental human decency to accept that others are different. Either way, with a fraction of the skill and money needed for success, Loden made a stripped-down blockbuster of a verite movie.